Emerging from a moment of political repression in Latin America in the 1970s, the theory and practice of “Theatre of the Oppressed” (TO) has had to continually adjust to remain relevant as a tool for revolutionary social change. Israeli activist and scholar Chen Alon has worked with various groups to create what he terms a “Polarized” TO model. Groups such as Combatants for Peace—an alliance of Palestinian and Israeli ex-combatants, co-founded by Alon—deploy the practice alongside direct actions and alternative memorial rituals. In this talk, Alon discusses the Polarized TO model and its application to Holot Legislative Theatre (HLT), a group he co-founded composed of African Asylum seekers and Israeli allies. Through TO-based interactive performances, HLT aims to arouse public and legal debate leading to political transformation. The presentation includes the digital presence of HLT actor Nouraldin Mussa, an asylum seeker from Darfur currently residing in Canada. Dr. Chen Alon is a theatre activist, actor and director, the head of Community-Based Theatre and Artivism for social change program, at the theatre department of Tel Aviv University. As a Major (res.) in the Israeli army he co-founded “Courage to Refuse”, a movement of officers and combatant soldiers who refuse to serve in the occupied Palestinian territories, an action for which he was sentenced to prison. Activism in the complicated reality in Israel/Palestine led him as a professional actor and director, from the repertory theatre, to search and create new forms of political activism, in the Israeli-Palestinian theatre to resist non-violently the occupation. 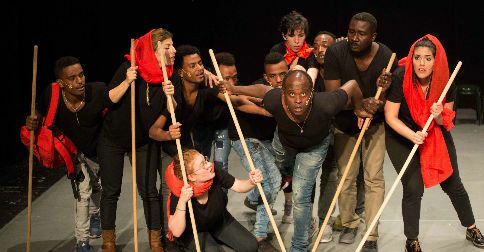 He is a co-founder and director-Joker of Holot Theatre, and group of African asylum seekers and Israeli citizens.